For a person who scavenges, see Waste picker. For other uses, see Scavenger (disambiguation). Scavengers are animals that consume dead organisms that have died from causes other than predation. While scavenging generally refers to carnivores feeding on carrion, it is also a herbivorous feeding behavior. Scavengers play an important role in the ecosystem by consuming dead animal and plant material. Decomposers and detritivores complete this process, by consuming the remains left by scavengers. Scavengers aid in overcoming fluctuations of food resources in the environment. The process and rate of scavenging is affected by both biotic and abiotic factors, such as carcass size, habitat, temperature, and seasons. Scavenger is an alteration of scavager, from Middle English skawager meaning "customs collector", from skawage meaning "customs", from Old North French escauwage meaning "inspection", from schauwer meaning "to inspect", of Germanic origin; akin to Old English scēawian and German schauen meaning "to look at", and modern English "show" (with semantic drift). Obligate scavenging is rare among vertebrates, due to the difficulty of finding enough carrion without expending too much energy. In vertebrates, only vultures and possibly some pterosaurs are obligate scavengers, as terrestrial soaring flyers are the only animals able to find enough carrion. Well-known invertebrate scavengers of animal material include burying beetles and blowflies, which are obligate scavengers, and yellowjackets. Most scavenging animals are facultative scavengers that gain most of their food through other methods, especially predation. Many large carnivores that hunt regularly, such as hyenas and jackals, but also animals rarely thought of as scavengers, such as African lions, leopards, and wolves will scavenge if given the chance. They may also use their size and ferocity to intimidate the original hunters (the cheetah is a notable exception). Almost all scavengers above insect size are predators and will hunt if not enough carrion is available, as few ecosystems provide enough dead animals year-round to keep its scavengers fed on that alone. Scavenging wild dogs and crows frequently exploit roadkill. Scavengers of dead plant material include termites that build nests in grasslands and then collect dead plant material for consumption within the nest. The interaction between scavenging animals and humans is seen today most commonly in suburban settings with animals such as opossums, polecats and raccoons. In some African towns and villages, scavenging from hyenas is also common. In the prehistoric eras, the species Tyrannosaurus rex may have been an apex predator, preying upon hadrosaurs, ceratopsians, and possibly juvenile sauropods, although some experts have suggested the dinosaur was primarily a scavenger. The debate about whether Tyrannosaurus was an apex predator or scavenger was among the longest ongoing feuds in paleontology; however, most scientists now agree that Tyrannosaurus was an opportunistic carnivore, acting mostly as a predator but scavenging when it could. Recent research also shows that while an adult Tyrannosaurus rex would energetically gain little though scavenging, smaller theropods of approximately 500 kg (1,100 lb) may have potentially gained levels similar to that of hyenas, though not enough for them to rely on scavenging. There are also an info that Otodus megalodon, Ceratosaurus, Andrewsarchus and some more prehistoric animals were scavengers. Animals which consume feces, such as dung beetles, are referred to as coprovores. Animals that collect small particles of dead organic material of both animal and plant origin are referred to as detritivores. Scavengers play a fundamental role in the environment through the removal of decaying organisms, serving as a natural sanitation service. While microscopic and invertebrate decomposers break down dead organisms into simple organic matter which are used by nearby autotrophs, scavengers help conserve energy and nutrients obtained from carrion within the upper trophic levels, and are able to disperse the energy and nutrients farther away from the site of the carrion than decomposers. 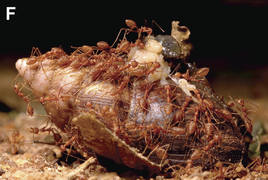 Scavenging unites animals which normally would not come into contact, and results in the formation of highly structured and complex communities which engage in nonrandom interactions. Scavenging communities function in the redistribution of energy obtained from carcasses and reducing diseases associated with decomposition. Oftentimes, scavenger communities differ in consistency due to carcass size and carcass types, as well as by seasonal effects as consequence of differing invertebrate and microbial activity. 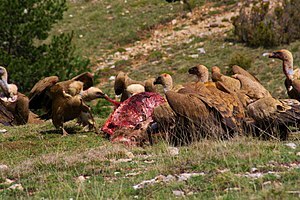 Competition for carrion results in the inclusion or exclusion of certain scavengers from access to carrion, shaping the scavenger community. When carrion decomposes at a slower rate during cooler seasons, competitions between scavengers decrease, while the number of scavenger species present increases. Alterations in scavenging communities may result in drastic changes to the scavenging community in general, reduce ecosystem services and have detrimental effects on animal and humans. The reintroduction of gray wolves (Canis lupus) into Yellowstone National Park in the United States caused drastic changes to the prevalent scavenging community, resulting in the provision of carrion to many mammalian and avian species. Likewise, the reduction of vulture species in India lead to the increase of opportunistic species such as feral dogs and rats. The presence of both species at carcasses resulted in the increase of diseases such as rabies and bubonic plague in wildlife and livestock, as feral dogs and rats are transmitters of such diseases. Furthermore, the decline of vulture populations in India has been linked to the increased rates of anthrax in humans due to the handling and ingestion of infected livestock carcasses. An increase of disease transmission has been observed in mammalian scavengers in Kenya due to the decrease in vulture populations in the area, as the decrease in vulture populations resulted in an increase of the number of mammalian scavengers at a given carcass along with the time spent at a carcass. Scavenging may provide a direct and indirect method for transmitting disease between animals. Scavengers of infected carcasses may become hosts for certain pathogens and consequently vectors of disease themselves. An example of this phenomenon is the increased transmission of tuberculosis observed when scavengers engage in eating infected carcasses. Likewise, the ingestion of bat carcasses infected with rabies by striped skunks (Mephitis mephitis) resulted in increased infection of these organisms with the virus. A major vector of transmission of diseases are various bird species, with outbreak being influenced by such carrier birds and their environment. An avian cholera outbreak from 2006 to 2007 off the coast Newfoundland, Canada resulted in the mortality of many marine bird species. The transmission, perpetuation and spread of the outbreak was mainly restricted to gull species who scavenge for food in the area. Similarly, an increase of transmission of avian influenza virus to chickens by domestic ducks from Indonesian farms permitted to scavenge surrounding areas was observed in 2007. The scavenging of ducks in rice paddy fields in particular resulted in increased contact with other bird species feeding on leftover rice, which may have contributed to increased infection and transmission of the avian influenza virus. The domestic ducks may not have demonstrated symptoms of infection themselves, though were observed to excrete high concentrations of the avian influenza virus. Many species that scavenge face persecution globally. Vultures in particular have faced incredible persecution and threats by humans. Before its ban by regional governments in 2006, the veterinary drug Diclofenac has resulted in at least a 95% decline of Gyps vultures in Asia. Habitat loss and food shortage have contributed to the decline of vulture species in West Africa due to the growing human population and overhunting of vulture food sources, as well as changes in livestock husbandry. Poisoning certain predators to increase the number of game animals is still a common hunting practice in Europe and contributes to the poisoning of vultures when they consume the carcasses of poisoned predators. In the 1970s Lewis Binford suggested that early humans primarily obtained meat via scavenging, not through hunting. In 2010, Dennis Bramble and Daniel Lieberman proposed that early carnivorous human ancestors subsequently developed long-distance running behaviors which improved the ability to scavenge and hunt: they could reach scavenging sites more quickly and also pursue a single animal until it could be safely killed at close range due to exhaustion and hyperthermia. In modern humans, necrophagy (eating of dead/decaying flesh) occurs rarely in most societies. This is likely an adaptation to the risk of disease, due to humans having lower levels of protective acids in the digestive tract, compared to species that are dedicated scavengers. Many instances have occurred in history, especially in times of war, where necrophagy and cannibalism can emerge as a survival behavior. "Scavenger" appears as an occupation in the 1911 Census of England and Wales. This job title applied to someone who cleans the streets and removes refuse, generally a workman (a modern-day garbage collector, janitor, or street cleaner) employed by the local public health authority. Young people in developing countries can revert to scavenging and thus develop entrepreneurship skills in order to operate in hostile economic contexts. In India, the term "manual scavenging" is used to describe the removal of raw (fresh and untreated) human excreta from buckets or other containers that are used as toilets or from the pits of pit latrines. The workers pile the excreta into baskets and may carry these on their heads to locations sometimes several kilometers from the latrines. India has officially prohibited the employment of manual scavengers since 1993, but the practice continues as of 2014[update]. The term "scavenger" originated as "scavager" or "scaveger", an official concerned with the receipt of custom duties and the inspection (scavage) of imported goods. The "scavagers" are found[by whom?] with such officials of the City of London as an aleconner or beadle. These officials seem to have been charged also with the cleaning of the streets, and the name superseded the older rakyer for those who performed this duty. These professions are essential to urban settings operating at the highest capacity. The garbage-collection jobs and scavenging professions allow urban populations to continue unhindered by outbreaks of disease most commonly caused by the build-up of physical waste. These jobs had great importance before the times of functional sewer systems and of indoor plumbing. ^ TAN, CEDRIC K. W.; CORLETT, RICHARD T. (2011-03-30). "Scavenging of dead invertebrates along an urbanisation gradient in Singapore". Insect Conservation and Diversity. 5 (2): 138–145. doi:10.1111/j.1752-4598.2011.00143.x. ISSN 1752-458X. ^ Castilla, A.M.; Richer, R.; Herrel, A.; Conkey, A.A.T. ; Tribuna, J.; Al-Thani, M. (July 2011). "First evidence of scavenging behaviour in the herbivorous lizard Uromastyx aegyptia microlepis". Journal of Arid Environments. 75 (7): 671–673. Bibcode:2011JArEn..75..671C. doi:10.1016/j.jaridenv.2011.02.005. ISSN 0140-1963. ^ a b c d Turner, Kelsey L.; Abernethy, Erin F.; Conner, L. Mike; Rhodes, Olin E.; Beasley, James C. (September 2017). "Abiotic and biotic factors modulate carrion fate and vertebrate scavenging communities". Ecology. 98 (9): 2413–2424. doi:10.1002/ecy.1930. ISSN 0012-9658. PMID 28628191. ^ Kane, Adam; Healy, Kevin; Guillerme, Thomas; Ruxton, Graeme D.; Jackson, Andrew L. (2017-02-01). "A recipe for scavenging in vertebrates – the natural history of a behaviour". Ecography. 40 (2): 324–334. doi:10.1111/ecog.02817. hdl:10468/3213. ISSN 1600-0587. ^ Switeck, Brian (April 13, 2012). "When Tyrannosaurus Chomped Sauropods". Journal of Vertebrate Paleontology. 25 (2): 469–472. doi:10.1671/0272-4634(2005)025[0469:TRFTUC]2.0.CO;2. Retrieved August 24, 2013. ^ Hutchinson, John (July 15, 2013). "Tyrannosaurus rex: predator or media hype?". What's in John's Freezer?. Retrieved August 26, 2013. ^ Kane; et al. (2016). "Body Size as a Driver of Scavenging in Theropod Dinosaurs" (PDF). The American Naturalist. ^ a b c Ogada, Darcy L.; Keesing, Felicia; Virani, Munir Z. (16 December 2011). "Dropping dead: causes and consequences of vulture population declines worldwide". Annals of the New York Academy of Sciences. 1249 (1): 57–71. Bibcode:2012NYASA1249...57O. doi:10.1111/j.1749-6632.2011.06293.x. ISSN 0077-8923. PMID 22175274. ^ Olson, Zachary H.; Beasley, James C.; Rhodes, Olin E. (2016-02-17). "Carcass Type Affects Local Scavenger Guilds More than Habitat Connectivity". PLOS ONE. 11 (2): e0147798. Bibcode:2016PLoSO..1147798O. doi:10.1371/journal.pone.0147798. ISSN 1932-6203. PMC 4757541. PMID 26886299. ^ Dunlop, Kathy M.; Jones, Daniel O. B.; Sweetman, Andrew K. (December 2017). "Direct evidence of an efficient energy transfer pathway from jellyfish carcasses to a commercially important deep-water species". Scientific Reports. 7 (1): 17455. Bibcode:2017NatSR...717455D. doi:10.1038/s41598-017-17557-x. ISSN 2045-2322. PMC 5727084. PMID 29234052. ^ a b Olson, Z. H.; Beasley, J. C.; DeVault, T. L.; Rhodes, O. E. (31 May 2011). "Scavenger community response to the removal of a dominant scavenger". Oikos. 121 (1): 77–84. doi:10.1111/j.1600-0706.2011.19771.x. ISSN 0030-1299. ^ Carrasco-Garcia, Ricardo; Barroso, Patricia; Perez-Olivares, Javier; Montoro, Vidal; Vicente, Joaquín (2 March 2018). "Consumption of Big Game Remains by Scavengers: A Potential Risk as Regards Disease Transmission in Central Spain". Frontiers in Veterinary Science. 5: 4. doi:10.3389/fvets.2018.00004. ISSN 2297-1769. PMC 5840163. PMID 29552564. ^ Wille, Michelle; McBurney, Scott; Robertson, Gregory J.; Wilhelm, Sabina I.; Blehert, David S.; Soos, Catherine; Dunphy, Ron; Whitney, Hugh (October 2016). "A PELAGIC OUTBREAK OF AVIAN CHOLERA IN NORTH AMERICAN GULLS: SCAVENGING AS A PRIMARY MECHANISM FOR TRANSMISSION?". Journal of Wildlife Diseases. 52 (4): 793–802. doi:10.7589/2015-12-342. ISSN 0090-3558. PMID 27455197. ^ Henning, Joerg; Wibawa, Hendra; Morton, John; Usman, Tri Bhakti; Junaidi, Akhmad; Meers, Joanne (August 2010). "Scavenging Ducks and Transmission of Highly Pathogenic Avian Influenza, Java, Indonesia". Emerging Infectious Diseases. 16 (8): 1244–1250. doi:10.3201/eid1608.091540. ISSN 1080-6040. PMC 3298304. PMID 20678318. ^ Binford, Lewis R. (1985). "Human ancestors: Changing views of their behavior". Journal of Anthropological Archaeology. 4 (4): 292–327. doi:10.1016/0278-4165(85)90009-1. ^ Lieberman, Daniel; Bramble, Dennis (2007). The Evolution of Marathon Running: Capabilities in Humans. Adis Data Information BV. p. 288. doi:10.2165/00007256-200737040-00004. Retrieved 2017-03-15. Human endurance running performance capabilities compare favourably with those of other mammals and probably emerged sometime around 2 million years ago in order to help meat-eating hominids compete with other carnivores. [...] [S]mall teeth, larger bodies and archaeological remains suggest that hominids started to incorporate meat and other animal tissues in the diet at least 2.5Ma, probably by hunting as well as scavenging. [...] [Endurance running] might have enabled hominids to scavenge carcasses from lions after they were abandoned but before hyenas arrived, as modern hunter-gatherers still do in East Africa. ^ Beasley, D. E.; Koltz, A. M.; Lambert, J. E.; Fierer, N.; Dunn, R. R. (2015). "Evolution of stomach acidity". PLOS ONE. 10 (7): e0134116. Bibcode:2015PLoSO..1034116B. doi:10.1371/journal.pone.0134116. PMC 4519257. PMID 26222383. Chase, et al. The Scavenger Handbook. Bramblewood Press, Santa Barbara, CA. Rufus, Anneli and Lawson, Kristan. The Scavengers' Manifesto. Tarcher, New York. "Tasmanian devil". Britannica Concise Encyclopedia. Chicago: Encyclopædia Britannica, 2009. Credo Reference. Web. 17 September 2012. Kruuk, H. Hunter and Hunted: Relationships between Carnivores and People. Cambridge, UK: Cambridge University Press, 2002. Print.